I have such vivid memories of setting our dining table for Christmas as a kid. My mom would pull out the holiday china, candles, ceramic Santa Clauses, and reindeer napkins that I loved assigning to each setting. I was always “Dancer,” my mom was “Vixen,” my dad “Dasher” and so on. There was comfort in knowing that no matter how much we aged or what kind of year we’d had or what was going on in the world, the same trusty pieces would show up for Christmas, silent reminders that everything changes and yet stays the same. Now that we’ve been in our house for a few years, we’re planning to host family Christmas dinner here. And while I still have quite a ways to go amassing the holiday decor of my dreams, I thought it’d be fun to pull some inspiration. I partnered with Roostery Home, the home decor division of Spoonflower, a digital textile printing company that allows customers to design and print their own fabric. Founded back in 2008, Spoonflower was the first of its kind and has grown to a big business that just so happens to be headquartered a few miles down the road from my house in Durham, North Carolina. 1) TEXTILES: I started with the tan buffalo check tablecloth, which brings a classic-country-modern vibe. I love the quality of the fabric and that this pattern looks textured like a wool sweater when it’s actually 100% cotton. The pattern is incredibly versatile (I used it for my daughter’s barnyard birthday party a few weeks ago). 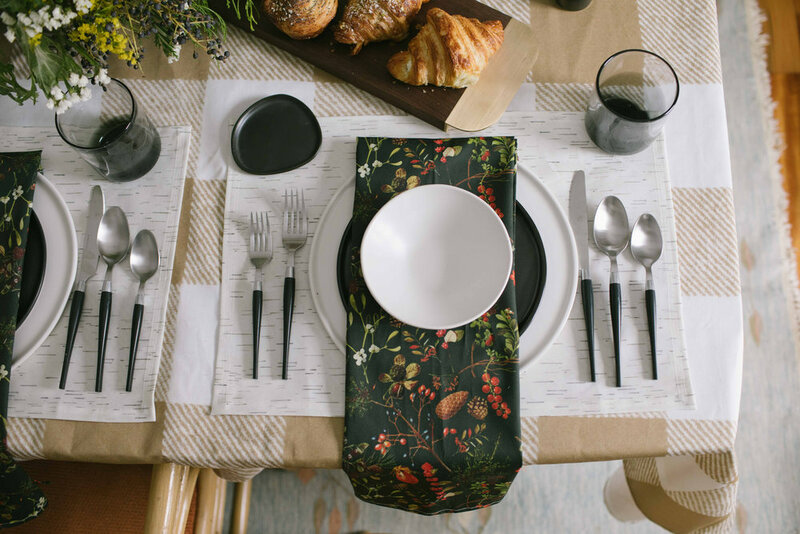 White birch placemats pull in the winter theme and avoid clashing with the tablecloth pattern, and then finally the vintage-inspired black napkins tie in the tan and white while introducing black and green and classic Christmas colors. 2) DINNERWARE: I recently discovered Haand, a pottery company based in Burlington, NC that supplies gorgeous modern dinnerware to customers and restaurants and retailers like Room & Board. I drooled over everything in the company showroom and honestly had a hard time narrowing down my options. But what I love about this dinner plate, salad plate and soup bowl combo is that it combines classic black and white in a cool way and will work long past the holiday season. Add in Haand’s salt and pepper set and mini bread plates and the look is truly complete. And given our house’s lack of storage as well as our tight budget, we’re always looking to invest in pieces that are both pretty and practical. 3) GLASSES: These hand-blown ombre black glasses are the work of a local maker Elijah Leed. He designs furniture and decorative objects that are modern and sophisticated and just so damn well-made. The glasses are an investment for sure, but one that you’d use daily and never tire of at your table. 4) SERVEWARE: This gorgeous walnut and brass serving board is another killer piece by Elijah Leed. The combination of the rich walnut with the warm brass handle is really top notch in my book. This is the kind of serving piece you’ll have—and will look stylish—forever. 5) FLOWERS: My favorite local florist, Pine State Flowers, contributed the beautiful centerpiece seen here. It’s filled with amaryllis, statice, mums, privet berries, acacia foilage, goldenrod, and local cedar. I love that it’s low enough to not get in the way of conversation, and brightens the table with a a little extra color. 6) PASTRIES: The last but MOST certainly not least part of the table were treats from East Durham Bake Shop, a wonderful bakery with to-die-for desserts and croissants and hand pies. I can never ever go in and buy just one thing. PS: Shout out to Katrina Williams of Fifty Two Hundred Photo for pulling off these gorgeous photos in a pinch!